Place:109-4&5, Bldg. of Life Sci. & Environ. Sci. 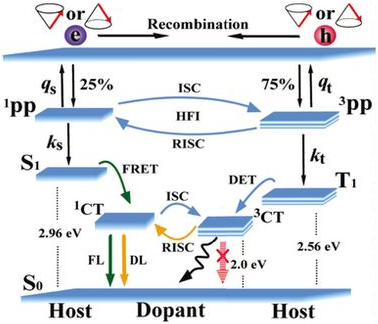 Non-emissive triplet excited states in devices that undergo thermally activated delayed fluorescence (TADF) can be up-converted to singlet excited states via reverse intersystem crossing (RISC), which leads to an enhanced electroluminescence efficiency. Exciton-based fluorescence devices always exhibit a positive magneto-electroluminescence (MEL) because intersystem crossing (ISC) can be suppressed effectively by a nexternal magnetic field. Conversely, TADF devices should exhibit a negative MEL because RISC is suppressed by the external magnetic field. Intriguingly, we observed a positive MEL in TADF devices. Moreover, the sign of the MEL was either positive or negative, and depended on experimental conditions, including doping concentration, current density and temperature. The MEL observed from our TADF devices demonstrated that ISC in the host material and RISC in the guest material coexisted. These competing processes were affected by the experimental conditions, which led to the sign change of the MEL. This work gives important insight into the energy transfer processes and the evolution of excited states in TADF devices.